Congenital ptosis is a troubling eye condition for pediatric ophthalmologists. There are many considerations to contemplate when deciding when to operate and which technique to use. A retrospective chart review of 69 pediatric patients treated for congenital ptosis using a double rhomboid frontalis sling with a nylon suture at a single tertiary care center. For patients with more than 6 months of follow-up, there were 38 patients with 46 primary surgeries (22 [58%] males and 16 [42%] females). The average age at the first surgery was 39.34 ± 33.18 months. There was a mean follow-up time of 51.87 ± 53.79 months. There were 7 children who needed one revision and 1 child who needed a second revision, equaling a 23.9% rate of revision. Patients who had surgery before the age of 3 years had a statistically significant likelihood of needing a second surgery (chi-square test = 7.246, P = .007, 95% confidence interval = 0.027 to 0.687). It was also statistically significant (P < .05) that, throughout childhood, older patients were less likely to need a revision. A double rhomboid frontalis sling using a nylon suture is an effective technique to treat congenital ptosis. This technique is easy to master and has a low cost compared to techniques involving autografts and allografts. It is also important to advise the family of the likelihood of a second surgery if there is a need to operate at a young age. Congenital ptosis is one of the many ophthalmic conditions for which a preferred method of treatment has yet to be determined. The most common operation is a frontalis sling, yet the method by which this is performed varies widely from surgeon to surgeon. Materials that have been used include autologous grafts, bioengineered slings, and plain sutures. Speed of the surgery, reoperation rates, and complication rates are of the utmost importance, especially with the potential need to bring a pediatric patient back to undergo general anesthesia. We reviewed the records of one pediatric ophthalmologist's (RW) surgeries for the correction of congenital ptosis between 2002 and 2016 to assess long-term success and complications. A retrospective chart review approved by our institutional review board was undertaken at a private pediatric ophthalmology clinic. Records of 69 patients who were operated on between 2002 and 2016 were reviewed. All patients received the same operation of a double rhomboid frontalis sling1 using a 1-0 Supramid (S. Jackson, Inc., Alexandria, VA) (nylon) suture on patients 36 months of age and older and a 3-0 Supramid suture on patients younger than 36 months. The 3-0 suture on a Ski needle was used instead of a Wright needle because the 3-0 suture is preloaded on the Ski needle. This is done because the Ski needle is smaller than the Wright needle and will do less damage to the smaller structure in younger children. Four patients were excluded due to missing information in their charts and 27 patients were excluded due to having less than 6 months of follow-up. A 15 or 11 Bard-Parker blade was used to make three stab incisions just above the brow: medially at the level of the inner canthus, at the level of the pupil, and laterally at the outer canthus at those marks perpendicular to the bone until the blade touches the periosteum. The incisions were extended to enable passage of a Wright needle. The Wright needle was passed from the central eyebrow incision, deep to the tissues in the forehead, exiting superficially via a stab incision using the Wright needle 1 mm superior and parallel to the central area of the eyelash margin. A 1-0 Supramid suture was threaded through the tip of the Wright needle so that it was folded in half and the needle was withdrawn from the superior incision with the folded suture. The suture was then cut in half so that there were two sutures in the plane of the medial incisions. The Wright needle was then used to make a superficial stab incision just above the eyelash line and nasal canaliculus and passed to the central eyelid incision. The Supramid suture was retrieved and brought to the nasal eyelid incision. The Wright needle was then driven from the superonasal eyebrow incision to the superonasal eyelid incision in the same plane as was used in the first vertical incision to retrieve the Supramid suture to the superonasal eyebrow incision. Finally, the Wright needle was passed deeply to all tissues from the superonasal eyebrow incision to the central eyebrow incision and retrieved this end of the same Supramid suture. This was the first rhomboid and the second was made in the exact same fashion using the middle and lateral incisions. Once all of the sutures were in place, the eyelid was everted to ensure no erosion of the conjunctiva with the suture. Traction was then applied to all sutures until the correct amount of eyelid elevation was achieved with good eyelid contour but without notching, ectropion, or eversion of the eyelashes. A 6-0 Mersilene suture (Ethicon, Inc., Somerville, NJ) was then alternately tied in with the Supramid suture to avoid slippage. The Mersilene suture was placed between the two sides of the Supramid suture. The Supramid suture was then double knotted, followed by a double knot of the Mersilene suture. This was followed by a single knot of Supramid, then a single knot of Mersilene, and then alternating another single knot of each suture. After all knots were tied, the knots were buried using a hemostat, creating a small tunnel in the eyebrow to diminish the likelihood of extrusion. The three eyebrow incisions were then closed using a 6-0 Monocryl suture (Ethicon, Inc.) followed by application of Derma-bond (Ethicon, Inc.). The eyelid incisions were not closed with a suture because they were self-sealing. A copious amount of tobramycin–dexamethasone ointment was placed on the cornea at the end of the case. Descriptive statistics were stated as mean ± standard deviation for continuous variables. Statistical analysis was performed using the chi-square test for the rate of revision. 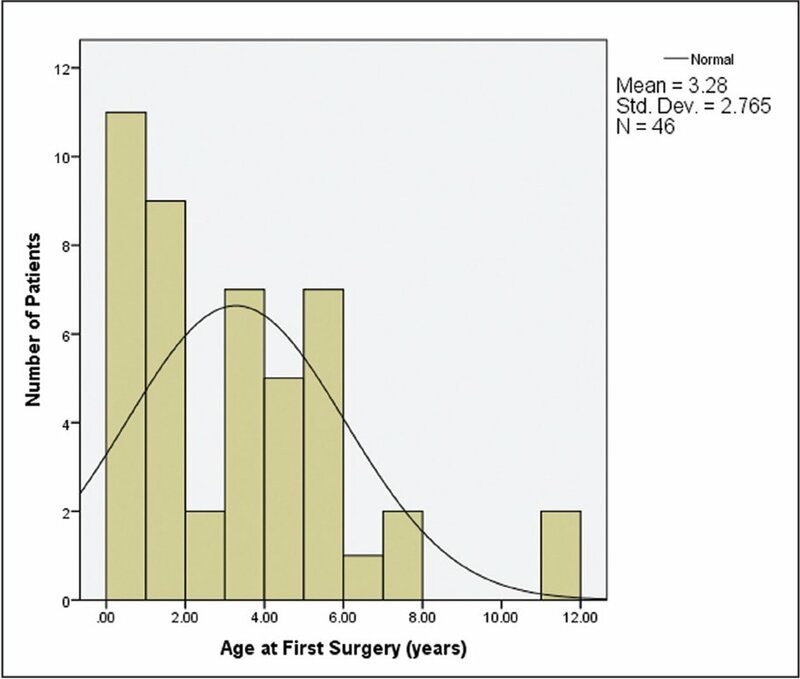 A binary logistic regression was performed to determine the likelihood of needing a second surgery based on age at the time of the first surgery. Of the 69 patient charts reviewed, there was a total of 77 primary surgeries. The average age at the first surgery for all patients was 42.12 ± 32.20 months. The follow-up time was 33 ± 48.73 months. Once the patients with less than 6 months of follow-up were excluded, there was a total of 38 patients with 46 primary surgeries. There were 22 (58%) males and 16 (42%) females. 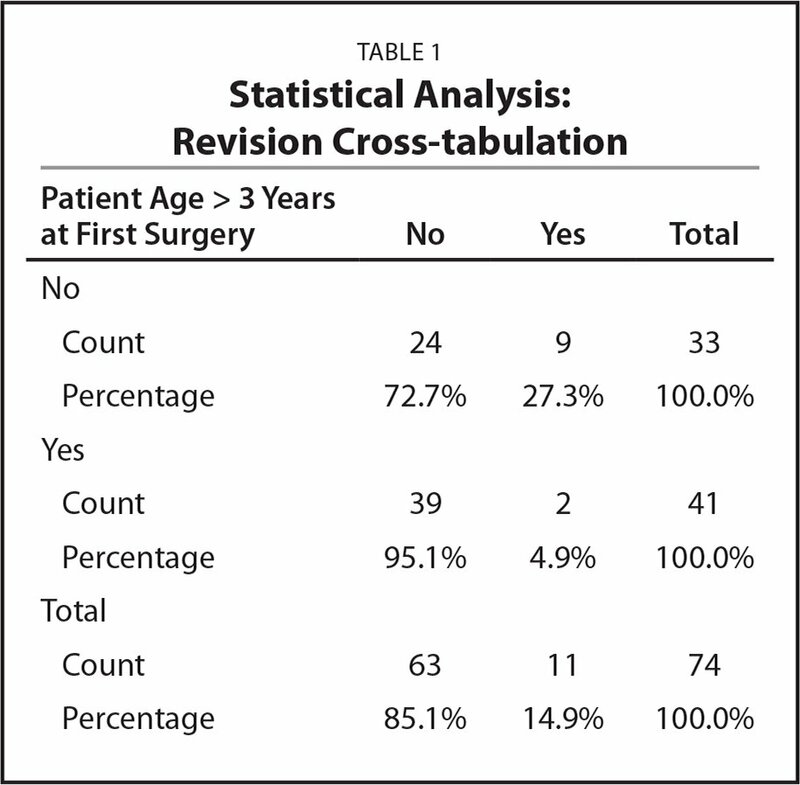 For these patients, the average age at the first surgery was 39.34 ± 33.18 months (Figure 1). There was a mean follow-up time of 51.87 ± 53.79 months (Figure 2). Distribution of age (months) at the time of first ptosis repair. 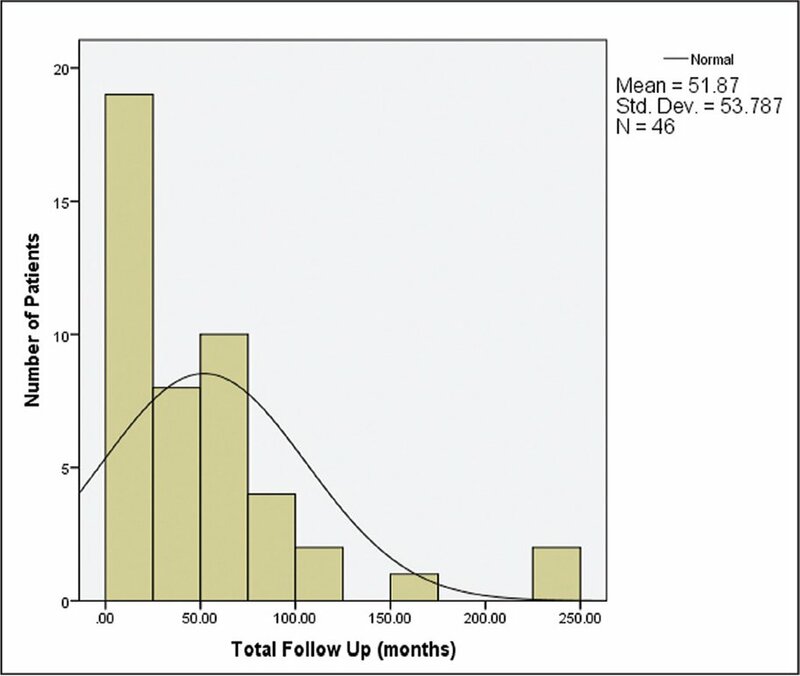 Distribution of length of follow-up (months) for patients with more than 6 months of follow-up. A total of 11 slings needed a primary revision, one of which needed a secondary revision. Two of the slings were in patients older than 36 months. For the patient who had two revisions, the first surgery was at age 2 months due to the degree of ptosis, the second surgery was at age 5 years, and the final surgery was at 21 years. Patients who had their first surgery before the age of 4 years had a statistically significant likelihood of needing a second surgery (chi-square test = 7.246, P = .007, 95% confidence interval = 0.027 to 0.687) (Tables 1–2). It was also statistically significant (P < .05) that, throughout childhood, older patients were less likely to need a revision (Table 3). Length of follow-up for patients younger than and older than 3 years was not significant (P > .10). This was even less significant due to lead time bias due to starting the follow-up period at a younger age for the younger group of patients. Complications seen in these patients included 9 granulomas in 8 patients, a 13.5% rate of granuloma formation, 1 suture infection that occurred 10 months after the surgery, 1 revision due to a slipped suture, and 1 revision due to an extruded and removed suture. All granulomas required surgical removal. The infection was caused by digital manipulation by the patient. Untreated congenital ptosis can cause numerous adverse events for a patient. For the ophthalmologist, the most important are astigmatic and deprivation amblyopia. For children and parents, bullying in school is also a major concern. For these reasons, it is important to correct the ptotic eyelid(s) on the first attempt, have as few complications as possible, and have the longest interval before a reoperation. Younger patients who have congenital ptosis repaired are more likely to need a reoperation due to the growth of all tissues without an increase in ability to elevate the eyelid(s). However, our increased revision rate may also be due to the thinner suture used on younger patients. As mentioned above, there have been numerous surgical techniques described and reviewed for the repair of congenital ptosis.2 The most common include using silicone, autologous grafts, mesh, and suture as a sling. Broughton et al.3 used fascia lata and reported a recurrence rate of 8% with a 2-year follow-up. Esmaeli et al.4 reported an overall reoperation rate of 21% within 1 to 7 years after surgery, with an average of 3 years until the reoperation.4 Sixty-four percent of their patients were younger than 3 years and those patients had an 80% recurrence rate. Lam et al.5 reported a 0% reoperation rate in 15 patients aged 2 to 7 years using autologous palmaris longus tendon with an average follow-up of 30 months. Many surgeons try not to use autologous grafts because this involves multiple surgical sites and harvesting grafts in a manner to which they may not be accustomed. This can lead to a higher likelihood of infection, more postoperative pain, and longer time for the patient to be under general anesthesia. Carter et al.6 used a silicone sling for patients younger than 3 years old. They reported a reoperation rate of 6.6%, but had only a 22-month follow-up period. Bansal and Sharma7 reported a 2.6% re-operation rate for 38 eyelids, with a mean follow-up of 18 months. They described 3 granulomas and 3 extrusions of suture. Galindo-Ferreiro et al.8 compared two methods using silicone rods for frontalis sling suspensions, each with an approximately 50% success rate. Katowitz9 described using a polyfilament cable-type suture and reported a recurrence rate of approximately 29%, with a follow-up of 1 to 10 years. Ben Simon et al.10 used a polytetrafluoroethylene suture and had a combined reoperation rate of 26% using two different techniques. They reported 2 granulomas, 3 infections, and 2 cases of suture exposure in 99 patients, with a follow-up time of 6 months to 9 years (mean: 20 months). Liu11 reported a 100% reoperation rate in 112 eyelids in patients 6 months to 50 years old within 1 to 18 months postoperatively. This study also showed a high amount of a variety of complications, some of which were not seen in other studies, including 10 granulomas, 3 suture exposures, 1 extrusion, 3 with unsightly scarring, 3 with peaking, 3 infections, 1 case of exposure keratitis, and 1 case of corneal cautery. This is surprising because there have been no other studies reporting such high reoperation and complication rates and this variety was not seen in other studies within such a short time period. The study stated that the operation was done by multiple surgeons and did not explain the technique. Tanenbaum et al.12 described a reoperation rate of 46.3% in 44 patients younger than 4 years by 5 years postoperatively. This study was done with the same surgical technique but different surgeons than our study. Lee et al.13 compared their results of fascia lata to silicone rod surgeries. They reported a reoperation rate of 20% at 3 years with the silicone rod and 50% with fascia lata. Hayashi et al.14 did a comparison study of a nylon monofilament sling to a polytetrafluoroethylene sheet in 42 eyelids. At 32 months, the nylon group had a 62% recurrence rate with no complications and the polytetrafluoroethylene sheet group had a 0% recurrence rate but a 7.1% complication rate. Wagner et al.15 compared banked fascia lata with nylon and reported an overall recurrence rate of 28.1% and a rate of granuloma formation of 12.4%. Individually, the fascia lata had a recurrence rate of 8.3% without any complications at 20.8 months and nylon had a 28.1% recurrence rate at 31.5 months with a 12.4% complication rate. Hersh et al.16 compared banked fascia lata to silicone slings. The fascia lata showed a recurrence rate of 35.3% with a complication rate of 35.3% and the silicone showed a recurrence rate of 13% with a complication rate of 15.2%. Wasserman et al.17 did a comparison study of six different materials for the sling. The recurrence rate ranged from 0% to 69.2%, the complication rate from 0% to 45.5%, and the follow-up period from 6 to 30 months. Our data show that using a double rhomboid technique to repair congenital ptosis is an equally effective treatment compared to the aforementioned surgical techniques. For most studies with long-term follow-up, the necessity for a second surgery was in the 20% to 30% range and that of our technique was 23.9%. The granuloma rate in our study was 13.5% compared to the mid-teens in long-term follow-up studies. Additionally, the double rhomboid frontalis sling is a relatively easy surgical technique to master and has a decreased cost compared to all other surgical techniques that use allografts, autografts, and other materials. Due to the simplicity of the surgery, there is also a decreased amount of time and morbidity when compared to harvesting fascia lata. It also has similar complication rates compared to the other techniques for congenital ptosis repair. Our analyses are also important to properly prepare the parents for likelihood of a second, or even third, surgery. Patients younger than 3 years generally have a greater degree of ptosis, necessitating earlier intervention. It is of the utmost importance to prepare the family for the fact that the patient will grow and will likely need a second surgery due to the inherent nature of natural tissue growth, although, once again, this may also be due to the thinner suture used in the younger age group. These data also help guide pediatric ophthalmologists and oculoplastic surgeons to try to delay the surgery without causing amblyopic damage or psychosocial damage to the patient to, potentially, alleviate the necessity for a second and even third surgery, whether it is due to tissue growth or to allow for the use of a larger (1-0) suture. There are numerous surgical procedures for the treatment of congenital ptosis. Surgeons have been using autographs, allographs, and different suturing techniques with varying success. The double rhomboid frontalis sling is an easy to learn and relatively inexpensive technique. Using a double rhomboid frontalis sling with a Supramid suture has long-lasting results that are predictable depending on the age of the patient at the time of surgery. More research is necessary to have direct comparisons of multiple techniques to help better improve patient outcomes. Levine M. Manual of Oculoplastic Surgery, 4th ed. Thorofare, NJ: SLACK Incorporated; 2010. Hersh D, Martin FJ, Rowe N. Comparison of silastic and banked fascia lata in pediatric frontalis suspension. J Pediatr Ophthalmol Strabismus. 2006;43:212–218. From the University of Miami, Bascom Palmer Eye Institute, Miami, Florida (AB, RW); Larkin Community Hospital, Miami, Florida (MS-G); and Florida International University, Miami, Florida (RW).